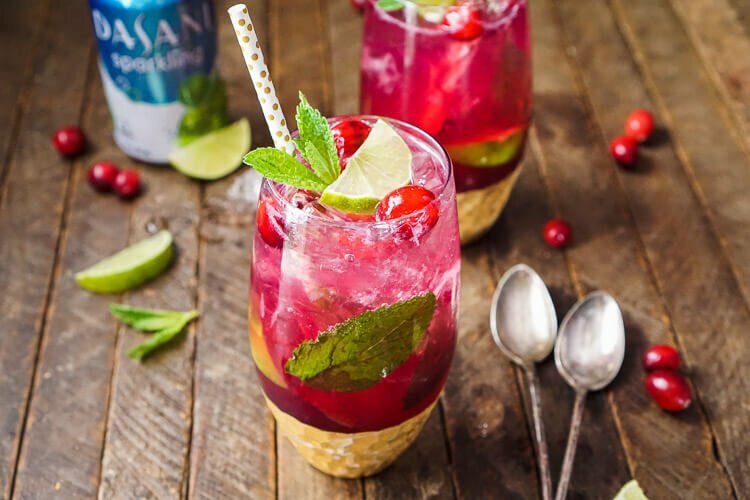 This Cranberry Mojito Punch is a festive, sparkling, and fruity large-batch cocktail that’s sure to have everyone dancing the night away at your holiday party! 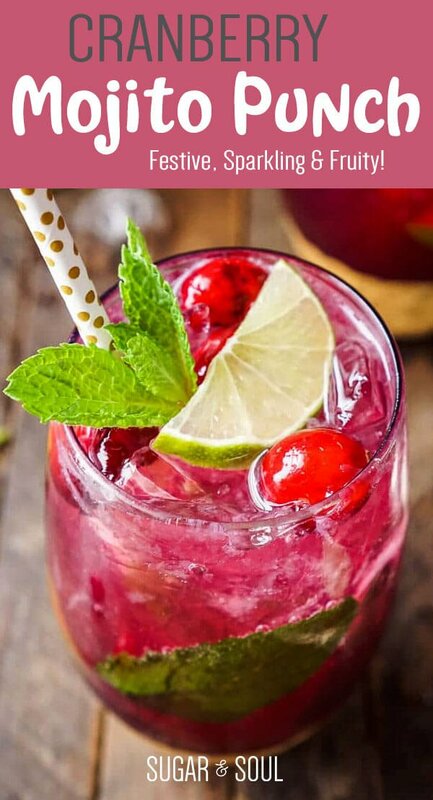 Although I have drunk two of these cranberry mojitos today, but it’s Friday night and it’s been a loooong week, okay? And frankly, I deserve it! Can’t let them go to waste either! Technically, tonight should be our annual Christmas Party, but I decided not to throw it this year. I know, how boring am I? But it’s been a crazy year with a lot of changes. So tonight we’re having date night instead and honestly, nothing sounds better to me right now than movies, takeout, puzzles, and cocktails with my husband. I think we all tend to overbook and out-do ourselves during the holidays, and sometimes a quiet night at home is all we need. But just because we want to be homebodies for the night doesn’t mean we can’t get into the holiday spirit! And when it comes to the holidays, I like a little sparkle! Usually, that’s through Champagne, like in these Champagne Shirley Temples, but I wasn’t really feeling like champagne for this drink and thought a splash of seltzer or sparkling water was a better idea, although, now I’m thinking Champagne mojitos could be a thing! I really love the sparkle the seltzer added to this cocktail and it was way more fun than a standard club soda, plus it gives the drink extra flavor! 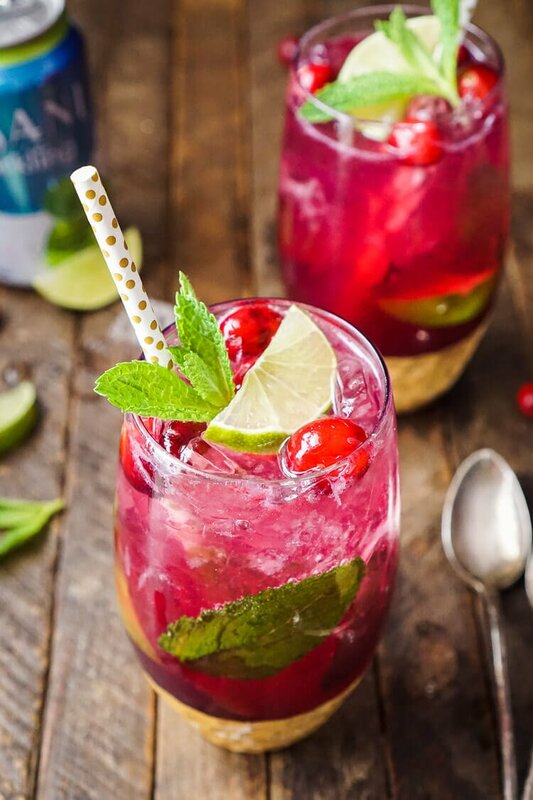 The zesty lime and tart cranberries are a perfect match in this Cranberry Mojito Punch and the essence of mint just amplifies it to a whole new level! 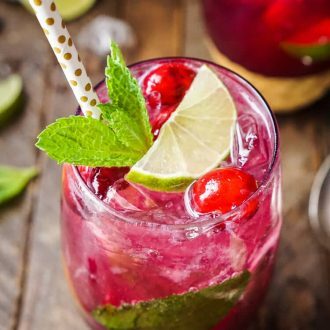 The best part about this drink is that you can make it ahead of time and the longer it sits, the more the flavors infuse! I put together a fun video to show you just how easy this holiday cocktail is to make! Or you can follow these directions! Add sugar and mint to a pitcher and muddle. 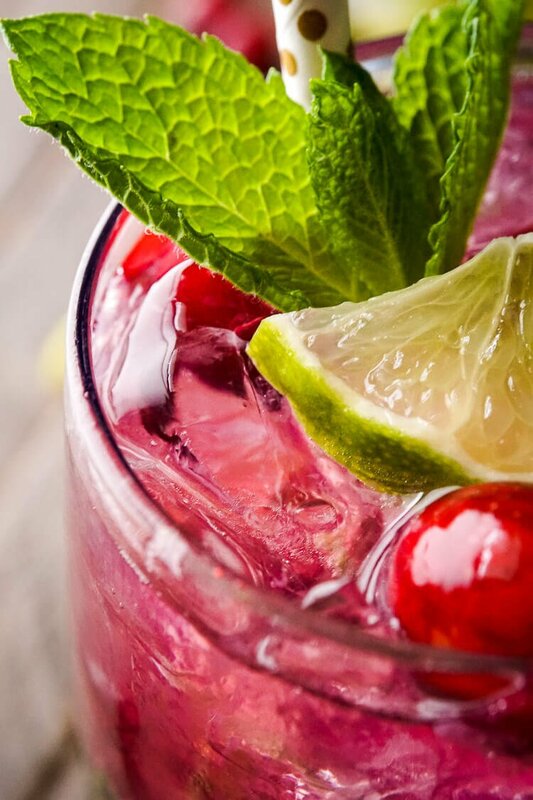 Add the slices of one lime along with 1 cup of fresh or frozen cranberries to the pitcher. Pour in fresh squeezed lime juice and rum, stir to dissolve sugar. Pour in cranberry juice concentrate and stir. Top off with lime seltzer. More great party food for the holiday season! 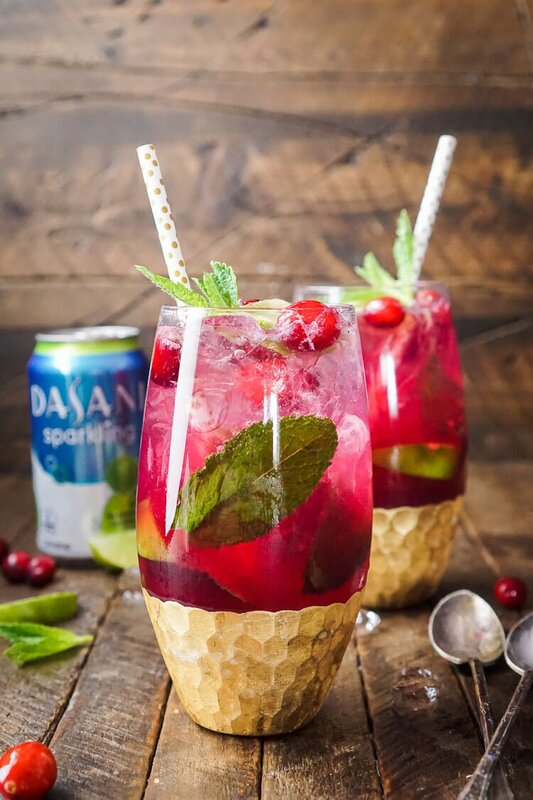 A festive sparkling cocktail that's sure to have everyone dancing the night away at your holiday party! Top off with seltzer or sparkling water. 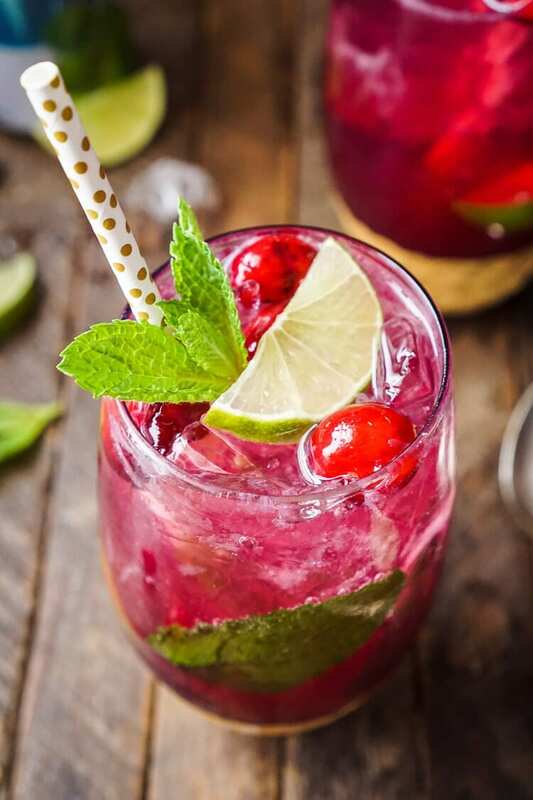 Fill glasses with crushed ice, pour punch over ice and garnish with cranberries, mint, and a fun straw. Replace Rum with extra seltzer for a non-alcoholic version. If making in advance, wait to add the ice and seltzer until just before serving so as not to water down or lose carbonation. Sparkling water or club soda may also be used. I think I love this pretty mojito more than the original! Such a fun flavor combo! Right!? And so perfect for the holidays too! This cocktail looks like Christmas in a glass! It’s so pretty and I love the addition of the sparkling water. I like to add flavored sparkling water to my cocktails as well instead of seltzer although I have to agree with you, a champagne or prosecco mojito would be delicious!